In the fragmented ecosystems where we live and work, the importance of diversity in our landscapes cannot be over emphasized. 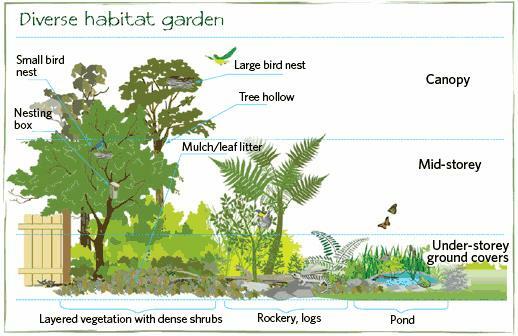 Here is a great article that is not too technical and easy to read on why a diversity of native plants is so important when we are practicing ecological landscaping and gardening. It explains why it is so important to have a wide diversity of native plant lists available for various habitats, soil types, and to support a diversity of wildlife. It is fine to have some of your favorite non native showy plants in your gardens or meadows, as long as you have a rich diversity of native plants that bloom at various times through the year, and provide seed and structure at various levels. I think this is short enough, yet ecologically resonant enough to appeal to our larger audiences. Maybe I can get some help spreading the good word around?! I think all NN Master Naturalists can benefit from this philosophy, both in our personal landscapes but also in group projects and in advising folks on ecological landscaping.Diversity of native plants, insects, mammals, birds, amphibians…. They all play a crucial role in sustaining a healthy environment. ELA grants permission for Northern Neck Master Naturalists to reprint “Landscaping with a Purpose” by Dr. Randi Eckel, providing that the reprint includes a citation that identifies the title and author of the document, includes the statement that the article was originally published in the February 2018 ELA Newsletter, and provides a reference or link to the ELA website (www.ecolandscaping.org). Permission is granted to reprint the article, providing that the reprinting includes the exact wording of the entire document. Permission is not granted for partial reprints.